wow those chicken bites are so beautifully cut..your husband was right..now they look even more tempting! Ooh…sweet tang. I do like orange chicken. Especially if it explores the range of possibilities within the sauce, like PF Chang’s. But broccoli with a delicate Chinese dish is like flotsam in a pristine pool. I suppose one could 86 the brocc. Ooh, ooh…got it. If the green thing has to be served with orange chicken, make it winged broccoli! Then it could fly away on its own. Bye-bye, broccoli. Do not phone home. Jean, it's sort of breakfast time here, but nonetheless I could happily demolish these. I'll be trying them for sure. I enjoy a (well-made, tender) sesame beef dish and this looks lighter. Thanks for the reminder on the importance of cooking the marinade thoroughly. these look so scummy and so 'pop in the mouth' ready to eat... SO HUNGRY! Pauline, thank you. Yes, I'm a real germaphobe and am always very careful about how food is handled in the kitchen. Thanks, Dom. Great to hear from you! 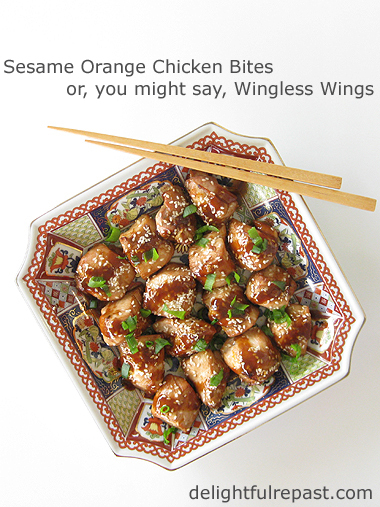 Wingless wings…I love the idea and yours sound delicious. Karen, thank you! Quick and easy, too. I think I'll be making a lot more of these. What a fanciful and appetizing idea, my darling Jean, you never stop to amaze me ! I cannot bear to eat anything with a bone, so these would be a wonderful alternative for me. What a great idea of yours and very tasty too I am sure! Thanks, Martha Ellen. I think orange and sesame is one of those magical culinary combinations! Thanks, Amy. I find that bones get in the way of my pretending that everything I eat is a vegetable! I really should be a vegetarian, but my husband doesn't thrive on it and I can't prepare two different meals. I love the way you have cut the chicken. Thanks so much, Debbie! Let me know how it turns out for you. Looks delicious and you can have a nice neat plate without a pile of bones. YES! That certainly is a plus as far as I'm concerned but the males in my family are carnivores that enjoy attacking bones. Perhaps I'll make some dainty bites for the females in the family and the males can attack the bone-in wings. Great idea! Have a wonderful weekend. Great idea Jean. Looks delicious. Thanks, Lea Ann. Have fun watching those Broncos! These are such a great idea! I love to eat chicken wings but I know that some people like the flavor but don't like the bones or the sometimes unsightly veins in them. Thanks for sharing at Saucy Saturdays! I am adding these to my Superbowl menu for sure! These look like a tasty alternative! Thanks, Jean! Jennifer, I'd freak out if I got one with unsightly veins in it! I hope you'll like these as much as we do. Have fun! Thanks, Jeanie! Have a wonderful hygge weekend! Yum! These look tasty! Going to have to give them a try. Thank you Jean for sharing this post at the Wednesday AIM Link Party. I shared it on my social media sites. Thanks so much, Grammy Dee! SM shares are always appreciated! I'm not sure about this one, Jean. Call me cantankerous, but, if we buy and present food such as chicken and other meats in a boneless state then do we, as a species, begin to forget where food comes from and how it is produced? We do tend to package beef, chicken, lamb, pork etc in such a way that we have no idea about how food actually gets to us. I think every child should know how we get food and how it is produced. It should be taught at school.If a few messy bones on our plates is a result then that's a good thing. Yes, Jean, call me cantankerous. Ha! Ha! Hi Jean, now that is a recipe to my liking. I know already from seeing the ingredients that you used that it must be good and I am inclined to try it out myself. One question, though, why would you not put your "best half sheet pan" under the broiler? Would the broiler damage the pan? Is the temperature too high? I don't have a half sheet pan, but thought I would use my small roaster that I got for Christmas and make a bigger batch. That should work, shouldn't it? Hi Christina, I was just going by maximum oven temps recommended by most manufacturers. I think I read somewhere that it was 450F. It would probably do fine under the broiler, but I just didn't want to take a chance with my favorite half sheet pan. Though I'm not a fan of disposables, I have on occasion been known to use an aluminum foil broiler pan. But back to the oven: If you have a couple of rimmed baking sheets of any sort, that would probably work better than a roasting pan. A roasting pan's higher sides might make a more steamy environment than a shallow rimmed baking sheet would. Let me know what you work out. This week we tried your chicken and oh was it ever delicious! That recipe is a keeper! Debbie, thank you so much! And I really appreciate your coming back and telling me about it. Hope you're having a delicious weekend! Like Mr. Delightful, I am not a fan of wings. This is the perfect solution! I am going to try these for dinner this week. I even have all the ingredients - which never happens! I also love the versatility of this recipe - appetizer or main course! Thanks, David! Hope you like it! I wanted to make soup for a sick friend this morning, didn't have all the ingredients, was at the nearest grocery store at 6:30am! These look so yummy, I would happily eat them this very moment! Thanks, Alix! I could go for some right now myself! These chicken bites sounds delicious. Pinning to my quick and easy recipe board. Joy, thank you! Social media shares are always appreciated! Looks so delicious, I would love to try them soon. Thank you, Menaka! I've apparently been making too many organic chicken dishes lately. When asked what he'd like for dinner, my husband said, "Anything but chicken!" Yum- this looks so yummy and completely doable! Kristin, thanks! Yes, it is completely doable! This would be a hit at my house! Looks good. I'm with you on chicken wings -- great flavor, but so messy. So I like to deconstruct mine, too. Never thought to use chicken breast, though -- but I will. Terrific recipe -- thanks! Thanks, TCoH! It's fun to have something that doubles as an appetizer or a main. KR, thanks so much! I hope you will try it soon, John. IN LIEU OF REUSING THE MARINADE, JUST RESERVE PART BEFORE COATING THE CHICKEN OR ADDING A BIT MORE TO ORIGINAL QUANTITIES. LOOKS TASTY. Thanks, Goofyfoot. Sure, you can do it that way, too, but I like reusing the marinade, after a good boil, so there's no waste. Jean - I wanted to let you know that we both loved this dish! It is going into our regular rotation! Thanks again. I hope your friend is feeling better! David, thank you for coming back and letting me know! And, yes, my friend is on the mend, just needs to make a couple of lifestyle adjustments. Thanks again. 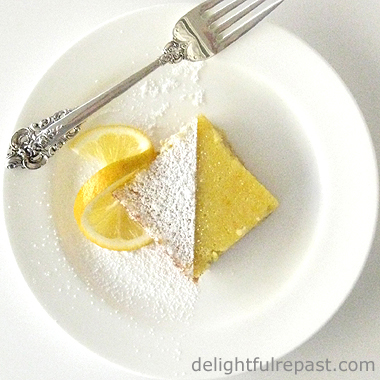 Jean, I love this recipe! It has tons of flavour and it's so versatile. I'm not a real bone person myself so wings are always a bit of a challenge. This is a great way to get all the flavour with none of the mess. I also like the idea of serving it with rice and a side! Shared on the Hearth and Soul Facebook page and Pinned. Thank you so much for being a part of Hearth and Soul. Have a lovely weekend! April, thank you so much. I really appreciate your comments, link parties, social media shares and your lovely blog! Yum, Jean! 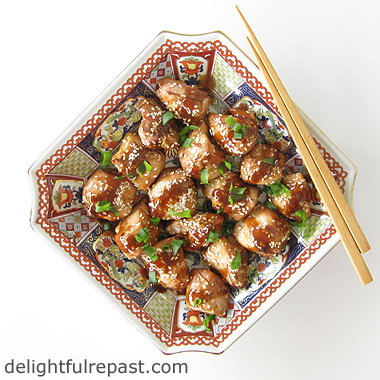 This Sesame orange Chicken Bites recipe is perfect in oh-so-many-ways! I am a thigh woman and also dislike chomping on little wing bones--so messy. The ingredients are just right and not only will Mr (not) Lightarted love these, so will I. Just got a pack of thighs so this will be on the menu soon! Thanks, Sue! Like I said, you might not get the cute little "even" bites with thighs, but if you can cope with "uneven" pieces you'll get great flavor. This sounds wonderful. Neither of us get the appeal of wings -- but this recipe (the way your hubby liked it) sounds delicious. Thanks. Jean, first off, this is a gorgeous presentation, just look at it! That plate, the chicken! Love it! Second, you are a life saver! My kids love orange chicken, the only recipe that I've ever tried had orange juice concentrate, and it was too much, the kids hated it! I've not tried it again. But I am going to use your recipe, it looks and sounds so good! This is going to make me the best mom ever! Nikki, thank you! I inherited those plates from my mother. Most orange chicken is syrupy sweet with lots of food dye, so I avoid it. I came up with this with just a touch of sweetness and orange flavor. Hope you an your kids like it!